There is now a Windows binary of a ccMiner fork available for mining Vanillacoin (VNL) that uses WhirlpoolX algorithm on Nvidia GPUs thanks to djm34. 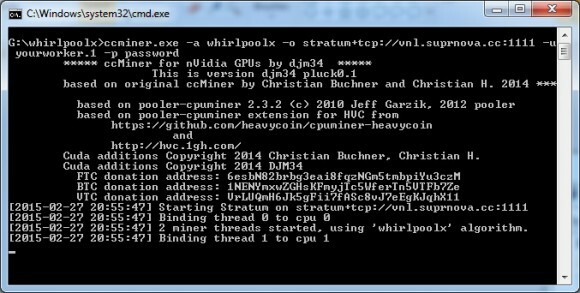 There is no source code released for the miner, only Windows binary that supports Compute 3.5 or newer Nvidia video cards. Do note that this version includes a 5% developer fee, so it will mine for the developer of the code to support his work! Also it seems that the miner only works on the two official VNL pools as well as the suprnova pool, it refuses to connect to to others. We are getting about 180 MHS on a stock GTX 980 GPU, though the author reports that is shold reach up to about 200 MHS, probably with some overclock it will. You should expect about 60 MHS on a GTX 750 Ti GPU according to the author of the miner code. Recently there was a boom of interest in VNL even though it has not yet been added on an exchange, though C-Cex is apparently going to add it very soon, meanwhile MRR, Beta Rigs and NiceHash/WestHash have all added support for the new WhirlpoolX algorithm, so apparently the user interest continues to grow. If you are looking for a high performance AMD GPU miner, you can find the latest sgminer fork with WhirlpoolX support here, it offers similar performance to what the same class of NVidia GPUs should provide using the ccMiner.